We’d love your help. Let us know what’s wrong with this preview of Three to Get Lei'd by Jill Marie Landis. A jigger of tranquility is all Em Johnson wants, but now that her beloved Tiki Goddess Bar has been chosen as the location for Trouble in Paradise, TV's hot new reality show, life is anything but tranquil. When a member of the camera crew is found dead in her kitchen-stabbed to death with Chef Kimo's sashimi knife-the scene on the sleepy North Shore of Kauai goes from ecce A jigger of tranquility is all Em Johnson wants, but now that her beloved Tiki Goddess Bar has been chosen as the location for Trouble in Paradise, TV's hot new reality show, life is anything but tranquil. When a member of the camera crew is found dead in her kitchen-stabbed to death with Chef Kimo's sashimi knife-the scene on the sleepy North Shore of Kauai goes from eccentrically crazy to downright dangerous. Suspects lurk behind every paper drink umbrella. It's not enough that Chef Kimo is the number one suspect or that the life's-a-party Hula Maidens nearly burn down the place while dancing the hula with flaming coconuts. Em still has to deal with her Uncle Louie's wedding to The Black Widow-until his fiancee's Mercedes plunges into the Pacific. Roland Sharpe, a handsome, Hawaiian, fire-dancing detective, warns the locals not to interfere, but Em and the madcap Maidens can't help themselves and soon wind up knee deep in danger again. Can the irrepressible troupe solve three murders before the champagne goes flat? To ask other readers questions about Three to Get Lei'd, please sign up. Another fun installment in the Tiki Goddess Mysteries from Jill Marie Landis. These books make me feel as if I'm on Kauai. The relationships between the friends, the main character Em and her uncle and especially the growing relationship between Em and hunky cop Roland are what propels these stories forward. Once again the Hula Maidens and the staff at the Goddess bar and restaurant are embroiled in murder. If you don’t know who the Hula Maidens are, you’ll want to read this series as they seem to be incomparable! This is a cozy mystery that will have you smiling and laughing along the way throughout the book. The characters are crazy, feisty and loveable. The plot keeps you guessing for most of it. It is full of bar drinks and most of the action takes place in the bar on Hawaii's north shore. I would enjoy reading the first two books of this series sometime. I don't drink, and have never been into a bar so the drink talk I have no idea but I think I would watch the reality show. The Tiki Goddess Bar has its own reality show Trouble in Paradise. They also have their own Hula dancers in the Hula Maidens. They are enjoying the fame. The Hula maidens are not very good and they are all senior citizens the oldest is 92 and wants to be called Cougar. The Hula Maidens are a feisty group of ladies, They are enjoying their fame and their high number facebook likes and friends. They support each other with their troubles and it is hard to keep secrets from them. Uncle Louie is the owner of Tiki Goddess and is getting ready to marry again to Marilyn. Marilyn used to be a Hula Maiden but left the group. Marilyn is feuding with one of the dancers Kiki. Kiki is married to the Chef Kimo. Who hates the cameras in his kitchen and in his way. Em has come to help her Uncle Louie manage the Tiki Goddess after her divorce that left her broke and alone. She does not like the reality show and how crazy it has made the bar. It has brought in a lot more business. Then the newest cameraman was found dead in the kitchen with the chef's knife in him and The chef had left in a hurry right before the body was found. Now Kimo is the prime suspect in the murder. Then before long another murder is committed. Em is worried about Kimo and Kiki and her Uncle Louie. She starts asking questions and tries to help. Detective Roland does not want Em to look into things. She got in trouble last time she tried to help him. Roland does ask her out though. If you like mysteries, laughter at outrageous over the top fun then read Three to get Lei'd and enjoy. I was given this ebook to read and asked in return to give honest review of it by Netgalley and BelleBooks. Things are always exciting at the Tiki Goddess Bar. As one of the ‘hottest’ bars on the island - things are about to get a ‘little’ more interesting. After the reality show Trouble In Paradise aired on TV - island life has been crazier than normal for the residents of the North Shore. Fans are flocking in from across the U.S. to see the Hula Maidens, purchase memorabilia, and see what the Tiki Goddess is ‘serving up’. Film crews bombard the staff of the Tiki Goddess Bar. Island life is anything Things are always exciting at the Tiki Goddess Bar. As one of the ‘hottest’ bars on the island - things are about to get a ‘little’ more interesting. After the reality show Trouble In Paradise aired on TV - island life has been crazier than normal for the residents of the North Shore. Fans are flocking in from across the U.S. to see the Hula Maidens, purchase memorabilia, and see what the Tiki Goddess is ‘serving up’. Film crews bombard the staff of the Tiki Goddess Bar. Island life is anything but normal since they started airing the reality show. Em Johnson tries to find a little bit of normalcy while running the day to day operations of the bar. However, the unexpected is always lurking around the corner. When a member of the film crew ends up with a knife to the chest, things go from wild to chaotic for the locals. If having her Chef Kimo framed for the murder wasn’t bad enough - Em has to deal with the crazy antics of the Hula Maidens. Crazy routines, fan clubs, and flaming coconuts make for lively entertainment. Uncle Louie is still planning on marrying the Black Widow despite everyone’s reluctance to the wedding. However, it wouldn’t be the Tiki Goddess without more ‘craziness’ than you can ‘shake a stick at’. This book brought back all the strengths from the first book with the added delight of everyone at the Tiki Goddess Bar being featured on a reality tv show. As a (not-so-secret) lover of reality tv for the over-the-top ridiculousness and a lover of cozies for their delightful tongue-in-cheek puns and ability to not take themselves too seriously, the marriage of the two in this book was sheer delight. A couple of scenes in particular struck me as the type of mad-cap tom-foolery seen in older 1920s This book brought back all the strengths from the first book with the added delight of everyone at the Tiki Goddess Bar being featured on a reality tv show. As a (not-so-secret) lover of reality tv for the over-the-top ridiculousness and a lover of cozies for their delightful tongue-in-cheek puns and ability to not take themselves too seriously, the marriage of the two in this book was sheer delight. A couple of scenes in particular struck me as the type of mad-cap tom-foolery seen in older 1920s romps, only with the added twist of reality tv cameras following the moves. I honestly would love to see a “The Office” style take on this series…a fake reality tv show version of the Tiki Godess Bar. That’d be a hoot! Anyway, one scene I really enjoyed involves the Hula Maidens in hula costume sneaking around on a golf course. Delightful. I also like that the plot, although a bit predictable, weaves in a few different elements of various characters’ lives and stories. Em’s life moves forward, as does her uncle’s. Nothing is stagnant, just because murder is happening. I also thought grief and concern for loved ones’ safety were depicted well and realistically without slowing the plot down or removing the joy from the narrative. All-in-all, a fun entry in the series that left me eager for the next one….and hoping the reality show will be back! Check out my full review. Aloha! This book has a perfect blend of mystery, romance, humor, and an introduction to the culture of the North Shore of Kauai. If a book could be described as ono, then this one would be. It is a delicious cozy mystery. The book starts with a reality crew having invaded the Tiki Goddess bar. Em Johnson is at wit's end. Then, one of the crew is killed in the kitchen with Chef Kimo's best sashimi knife and the fun begins. Enter Roland Sharpe, fire dancing detective, who begs the Hula Maidens to s Aloha! This book has a perfect blend of mystery, romance, humor, and an introduction to the culture of the North Shore of Kauai. If a book could be described as ono, then this one would be. It is a delicious cozy mystery. The book starts with a reality crew having invaded the Tiki Goddess bar. Em Johnson is at wit's end. Then, one of the crew is killed in the kitchen with Chef Kimo's best sashimi knife and the fun begins. Enter Roland Sharpe, fire dancing detective, who begs the Hula Maidens to stay out of the investigations this time. But, there is fat chance of that since Kimo is married to one of them. 2 more murders, one pinned on Kiki, Kimo's wife. The Hula Maidens stick together, which means that between Em's amateur sleuthing and the Hula Maidens' activities, they are driving Roland round the bend. Can the Hula Maidens solve the mysteries before Kiki and Kimo end up in jail or there is a 4th murder? 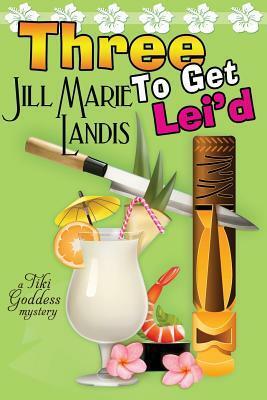 Three to Get Lei'd (A Tiki Goddess Mystery #3) by Jill Marie Landis was released by Bell Bridge Books May 24, 2013. You can read more about the Tiki Goddess Mysteries at The Tiki Goddess. Disclaimer: I received this book free from BelleBooks in exchange for an honest review. I did not receive any form of compensation. This was one of the funniest cozy mysteries that I had read in quite a while. I absolutely fell in love with the characters from the first page. I especially loved the Hula Maidens. They were over-the-top hilarious. Think Grandma Mazur from the Stephanie Plum series, except a bunch of them! Poor Em is overwhelmed when the Tiki Goddess Bar is taken over by a camera cre Disclaimer: I received this book free from BelleBooks in exchange for an honest review. I did not receive any form of compensation. Poor Em is overwhelmed when the Tiki Goddess Bar is taken over by a camera crew for a reality TV show. Of course, every is hamming it up so they can get their time on camera. However, some people prefer to stay out of the lime light (Em included). When one of the camera men winds up dead in the pantry, things really start spiraling out of control. And this is just the first of three murders in this book. I tore through this book really quickly because I just didn't want to put it down. I was hooked. In this episode, the Tiki Goddess has been taken over by a camera crew from the reality TV show, Trouble in Paradise. Thanks to the popularity of the pilot, the Hula Maidens are more rambunctious than ever, obsessed with accumulating fans and Facebook likes. They are practicing less and their dancing is worse than ever. Em is at her wit's end, though the money from the show has come in handy. Then one of the cameramen is murdered in the kitchen, and everything changes. This installment opens up In this episode, the Tiki Goddess has been taken over by a camera crew from the reality TV show, Trouble in Paradise. Thanks to the popularity of the pilot, the Hula Maidens are more rambunctious than ever, obsessed with accumulating fans and Facebook likes. They are practicing less and their dancing is worse than ever. Em is at her wit's end, though the money from the show has come in handy. Then one of the cameramen is murdered in the kitchen, and everything changes. This installment opens up with big, big laughs, then takes a turn to the more serious in the middle, but ends with more hilarity. I thought the murderer was fairly obvious, but still enjoyed the book because of the characters. If you're looking for an amusing cozy mystery series with a lot of local color, you can't do much better than this one. This review has been hidden because it contains spoilers. To view it, click here. Em's beloved bar, the Tiki Goddess, has been chosen to host a hot new reality show called Trouble in Paradise. Everything should be all good right? Wrong. A member of the camera crew has been murdered and Em's Chef is the prime suspect in the murder. Then there is a second murder and Em and the Hula Maidens must work quickly to find the killer before there is a third. This is my first book by the author and the Hula Maidens have made this book hilarious. I absolutely loved those quirky old ladies Em's beloved bar, the Tiki Goddess, has been chosen to host a hot new reality show called Trouble in Paradise. Everything should be all good right? Wrong. A member of the camera crew has been murdered and Em's Chef is the prime suspect in the murder. Then there is a second murder and Em and the Hula Maidens must work quickly to find the killer before there is a third. This is my first book by the author and the Hula Maidens have made this book hilarious. I absolutely loved those quirky old ladies. They really made this book. The book is very character driven and most of it is centered around the Hula Maidens but it is still worth the read. A must for a tropical escape for Stephanie Plum series readers. Nothing like feeling like Grandma Mazur left her twin on the islands! This was the first of the series that I had read and now I am going to purchase the others in the series and wait impatiently for another installment in the series. Grabs some laughs in the tropics while you are sitting inside on a cold winter evening trying to keep warm! I bought the first in the series as a nook daily find. I enjoyed it enough on vacation to read the second in the series, and then the third. Fun, enjoyable fast reads, to enjoy when you don't want to read anything serious. I enjoyed this book, #3 in the Tiki Goddess Series. This one involves the Hula Maidens trying to solve another mystery on the island of Kaui in which one of the Maidens and her husband are implicated. Another fun read! (E-Lib) It's been so long since I've read this series, I'm nervous that I won't remember the characters. So, I just finished this, and all of the characters did come back to me. The Hula Maidens are kooks, but the stories are cute. I wonder if the next book will take place in LA? This is a good cozy series. Set in Hawaii at a tiki bar, murder seems to follow this unlikely cast of characters. Em and her uncle run the beach tourist bar, and the local grandmother group provide the entertainment by hula dancing. Funny and well written, a great beach read. This is the second book in the Tikki Godess series I've read. It's light reading that comes with a few laughs. The characters are hilarious. More fun with Ema and the Hula Maidens. Yep, another murder for the detective to solve. Another possible date between him an Ema. Lots of fun and a good read. I sincerely hope for a 4th installment! Love these books....getting to the end is like leaving a bunch friends! The Tiki Goddess mysteries get better and better! Fun lighthearted series based on Kauai! Discovered I like Cozy Mysteries. Had to re read it.It is just so much fun. I love this series.I cannot get enough of the Hula Maidens! I enjoyed this mad romp of murder and mayhem with the Hulu Maidens. While it wasn't great literature, it was the perfect accompaniment for my Hawaiian vacation.